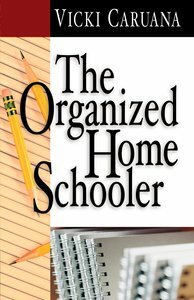 About "The Organized Home Schooler"
Vicki Caruana is an educator at both the high school and college level. She is a professor for the college of education at St. Petersburg College and a learning specialist at The Collegiate High School in St. Petersburg, Florida. She has written more than twenty books about education for parents and teachers and is a frequent educational and homeschooling conference speaker. Vicki authored the best-selling book "Apples & Chalkdust: Inspirational Stories & Encouragement for Teachers".